Detroit’s population was growing rapidly in the early 1920s but most people did not own automobiles. There were no suburban shopping centers nor were there mega theaters with 32 screens and acres of free parking. However, the rapidly growing middle class had time to enjoy entertainment and funds to pay for tickets. Black and white moving pictures—with plots and talented thespians—were beginning to take hold in the early 1920s. Thus the early and mid years of the 1920s were when many huge theaters were built in Detroit to serve a growing clientele of people who would take the streetcar to downtown to enjoy a movie or a live performance. The Palms Theater, the Fox Theater, the Michigan Theater and the United Artists Theater date for this era as well as almost a dozen other smaller theaters that did not survive to the Twentieth First Century. The investors who promoted the building you see apparently wanted a theater that could be used for vaudeville performances and for movies. However, the financial institutions that loaned money were skeptical about the possibilities for generating revenue from selling tickets to movies. I have read that there were willing to loan money on the condition that the architect design a building that could be converted into an office building if movies proved to be gossamer. C. Howard Crane—perhaps the nation’s most accomplished and popular architect for movie theaters—designed the original structures. When it was opened, it apparently had seats for 4,250 making it, perhaps, the fifth largest theater in the universe. Movies were a new entertainment form in the early 1920s so there was no well established model for a movie theater. If you think about the early theaters Crane designed, they were meant to suggest an escape from reality. Today we think of movie theaters as large black boxes connected to linear corridors where popcorn may be purchased. There is nothing romantic about post-World War II movie houses. They are functional buildings. But it was different when Crane designed the first generation of movie theaters. He wanted a building that would transport you from the hum-drum life of Detroit and allow you to readily imagine that you were someplace else. Note the elaborate and rather Oriental decorations on the outside and the insid e of the nearby Fox Theater. C. Howard Crane apparently intended that the structure you see should resemble a European Opera House. There may be an Italian or Italian Renaissance theme to his design but, in the style of that era, he added eclectic elements from the Rococo, and Baroque traditions. Elegance was the motivating theme for the interior with huge chandeliers, marble drinking fountains, marble stairs and brass fixtures throughout. He selected red-rose Italian damask for the heavy major curtain. As you walk around this building, you may realize that, as originally designed, there was a face on Madison in a Neo-Georgian design while, for the face on Broadway, C. Howard Crane selected to use terra cotta in a Beaux-Arts design. Was he being playful or did he think that movies would not last and that investors would need a structure that looked like a prosperous office building? This building opened on January 12, 1922 as the Capital Theater. I presume that they presented movies, vaudeville and a variety of other musical features. I do not know if this building was ever used for legitimate theater. A long list of impressive artists performed on this stage, including Louis Armstrong, Ray Charles, Duke Ellington, Guy Lombardo, Sal Mineo, Luciano Pavarotti, Roy Orbison and Will Rogers. In 1929, the Capital Theater was renamed the Paramount Theater. Five years later, the Paramount Theater became the Broadway-Capital Theater. The building was remodeled in 1960 and reopened as the 3,367-seat Grand Circus Theater. It carried this name until it closed in 1978. The venue reopened in 1981, but then closed in 1985. 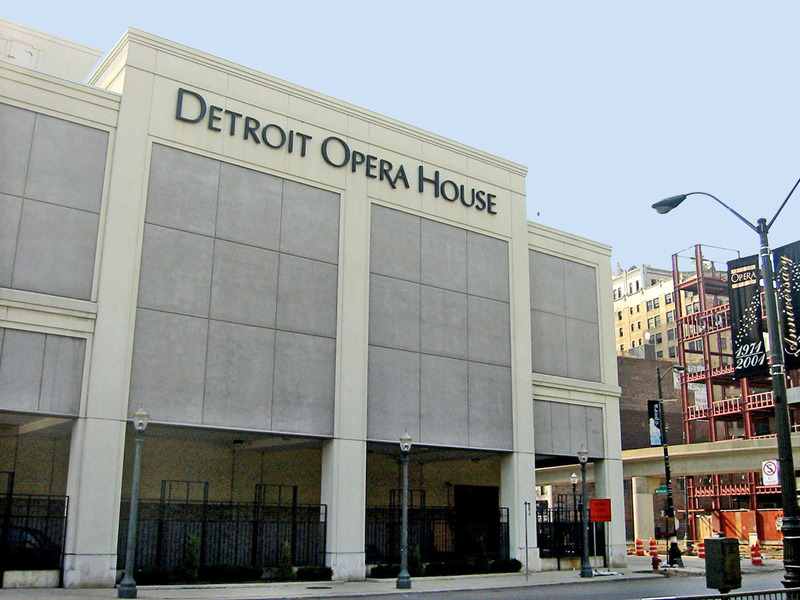 In the mid-1990s, the Michigan Opera Theater Company raised $14 million to remodel this building as part of the revitalization of downtown Detroit. They hired the Albert Kahn firm to remodel the building for its present use as their home. I do not know if the recent changes should be called a remodeling or a rebuilding. I do not believe the Michigan Opera Theater Company sought to restore the building to the exact design that C. Howard Crane produced. I believe the current exterior differs greatly from his design. Nevertheless, an extremely elegant theater once again graces Grand Circus Park. Luciano Pavarotti was the featured artist at the 1996 reopening of this theater. 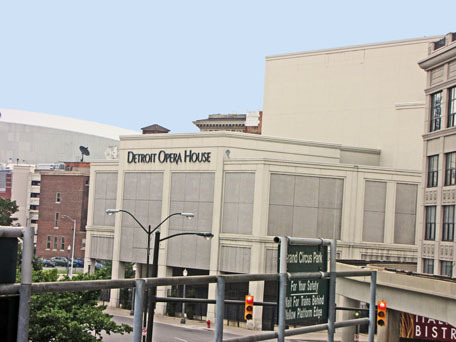 Incidentally, there were at least three previous buildings in downtown Detroit that used the name, The Detroit Opera House. From 1869 to 1963, there was a building at Kennedy Square that was known as the Detroit Opera House. The Whitney Grand Opera House was located near the intersection of Griswold and Michigan. Finally, there was a building known as the New Detroit Opera House located close to the intersection of Randolph and Monroe that stood from 1886 to 1928.